Education for Ministry (usually abbreviated as EfM) is an adult learning program that seeks to enable people to see and to experience the connection between Christian faith and daily life. EfM helps us to interpret the richness of the church’s faith in our complex world and to express it with confidence, in both words and actions, in our day-to-day lives and in our own communities. EfM can be summed up as Exploring Faith Matters! It is formational and transformational for Christian life and ministry. We do EfM in small groups led by trained mentors. Through individual study, sharing discoveries and exploring our faith together, we learn to think theologically. We connect what we come to know of the Christian tradition with our ordinary daily activities. 2 additional texts are studied by all year levels. Books are purchased seprately by each student. EfM was developed in 1975 by the Anglican School of Theology at the University of the South in Tennessee, and the University continues to update the program, most recently in 2014. EfM has expanded internationally and ecumenically—with groups in Canada, Great Britain, New Zealand, Hong Kong, Mexico, The Bahamas, and Botswana as well as the USA, and including people from other denominations. Over the years 80,000 people have participated in EfM. 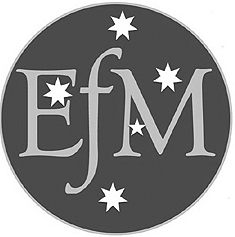 EfM began in Australia in 1978 and is now administered, under licence from the University of the South, by The Anglican Diocese of Brisbane as EfM-Australia. In Australia over 2000 people have completed the four-year program. EfM is open to people of all denominations and faiths.